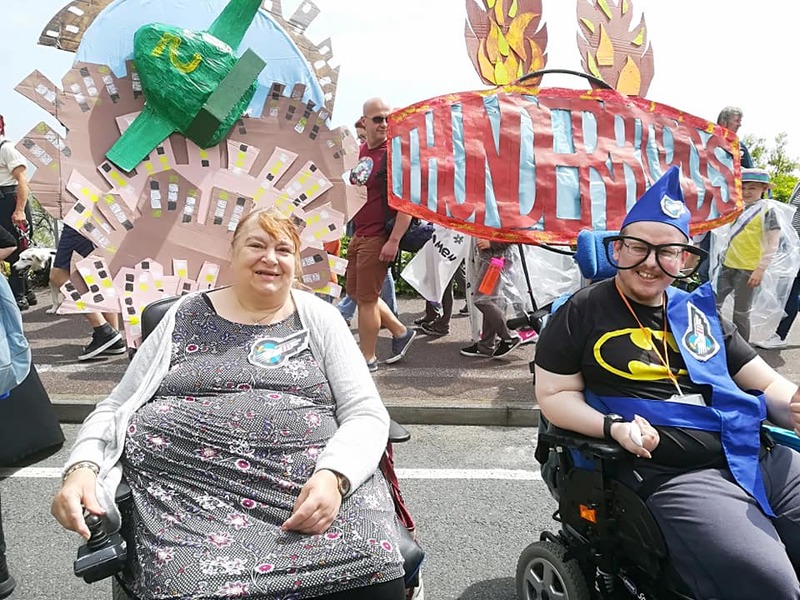 This year The Chaseley Trust decided to enter the Eastbourne Sunshine Carnival. We are very lucky that is starts right outside our door. We were part of a group entry that included, Cotton Candy, Lucy Dean Creative Space, The Hive Mencap, ESCC Disability Bikes, The Meningitis Fundraising duo, The Shed, Annimazing, Alex Abrahams Music and Leaf Hall Community Arts Centre. 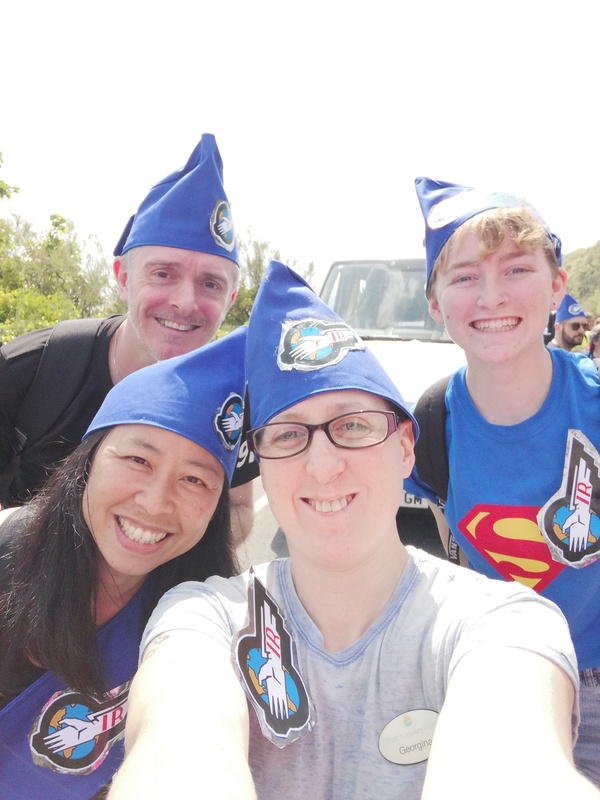 The residents had great fun in the lead up to the day creating the outfits and big props for our theme, which was Thunderbirds. Then on the day there was a mad rush to get all dressed up and out the door on time to be judged as a group, but we made it and all looked amazing. 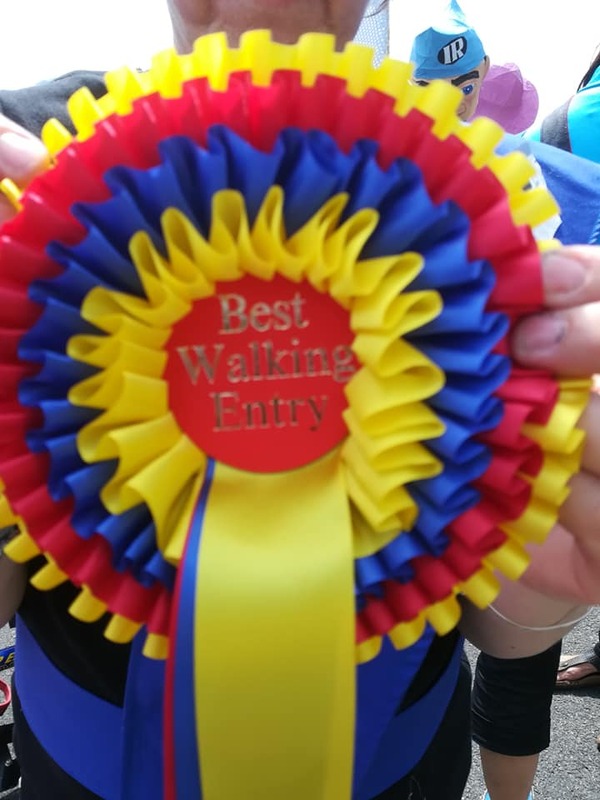 We were then awarded the rosette for best walking entry group, we were so happy that all the hard work paid off. The rest of the day went without a hitch, well maybe just one or two, but the sun was shining and a few made it down to the end for a much needed ice cream. We had a number of volunteers helping us one of which was the lovely Innei Shum who had this to say about the day. “I’ve been a resident of Eastbourne for about 15 years, and during that time I’ve experienced a handful of carnivals, bonfires and other processions that make their way along the seafront. To me, they’re always a ‘nice day out’ or ‘something to do’. This year was slightly different; this year I was lucky enough to actually be part of the Sunshine Carnival in Eastbourne. I skate for a local roller derby team, and my team mate, Georgie, mentioned that her workplace were going to be part of the carnival. Georgie is always doing some kind of charity event for her workplace, and having missed a few events previously, I agreed to participate in the carnival….especially as they were going to allow me to do it in my skates; this was a win win situation for me. So on Saturday 26th May, I arrived at the Chaseley Trust. I didn’t really know what to expect, but the first thing that struck me as I walked up the path to the main entrance was how lovely the grounds were. The plants, grass and other foliage looked bright, well maintained, and welcoming. The building itself looked rather grand from the outside too. Looking round at the props that were being attached to various participants’ wheelchairs, not to mention two massive Thunderbird figures, a lot of time and effort had been invested by both residents and staff alike. These props were good, both in quality and imagination; Tony Hart and Blue Peter would have been proud. The Chaseley Trust ended up winning the award for Best Walking Entry, well deserved in my opinion. The day was a success; the sun came out for the Sunshine Carnival, lots of the public came to cheer and support and generally just a great atmosphere. The Chaseley trust wants to thank everyone who was involved and we look forward to next year.